One of the most iconic automotive designs of all time, the Jaguar E-Tpye recently celebrated its 50th anniversary. This Series 1 Roadster is equipped with the 4.2-liter straight six that was introduced to the line in October of 1964. The engine produced 265 horsepower, making this car a serious performer in its day. 1967 was the final year for the Series 1 before it became the series 1.5, which carried the same body style with slight modifications. This transitional model was built until the introduction of the Series 2 in 1969. Total production for Series 1 convertibles was 6,749. Enzo Ferrari called the E-Type “the most beautiful car ever made” and he is not the only person to think so. E-Types come up for auction regularly. Look for this to catch a price right around $90,000-$100,000, the average for a Series I at auction over the past few years. More info on this car is available here and more on RM in Arizona here. 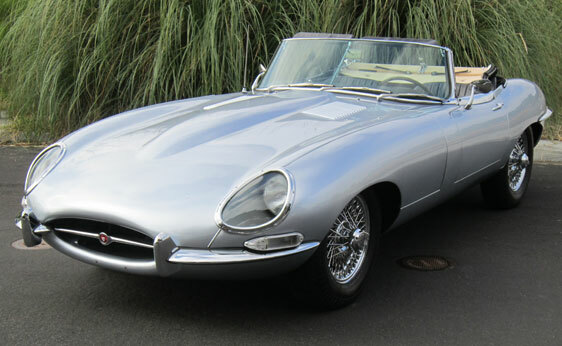 This entry was posted in Uncategorized and tagged 1967, auction, car, classic, convertible, e-type, jaguar, RM, rm auctions, roadster, series 1, series i, silver, xke by classiccarweekly. Bookmark the permalink.